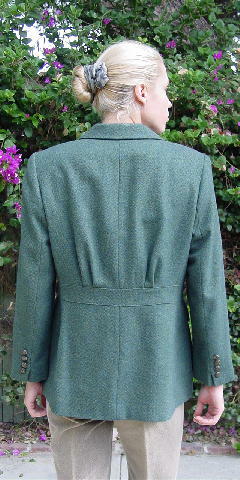 This Spanish olive green and medium royal blue 100% wool jacket has a mini chevron pattern. 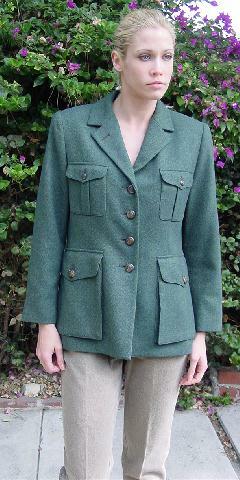 It has shoulder pads, a Spanish olive 100% acetate lining, 4 Lauren logo (horse's head) buttons down the front and 4 on each sleeve. 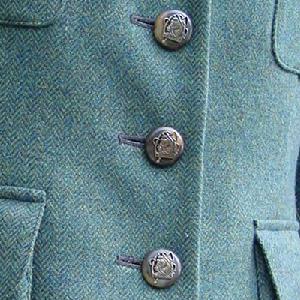 It has a military styling with 4 front pockets (2 breast and 2 lower) with logo button flaps. The back has a 12" by 1 3/4" horizontal band with 2 small pleats extending upward from the band. It was used in a magazine photo shoot and for pictures for a model's portfolio. shoulder to end of sleeve 22 3/4"